Thanks again for the great feedback on my article featuring Chet Whitehair. He is truly a fascinating man. I was thinking about how much has changed in terms of moving the President and former Presidents of the United States around the country. Over the years we have had many government officials pass through our facility and arrive here at the airport. My father's company, AeroMech, flew many of them in our air charter operations during their campaigns in West Virginia. I have had the honor and privilege of meeting three Presidents and one Vice President here at the North Central West Virginia Airport. I have also greeted all of our Governors and other dignitaries who have passed through the facility since we moved into the new hangar in 1991. I will blog more on that in another writing. 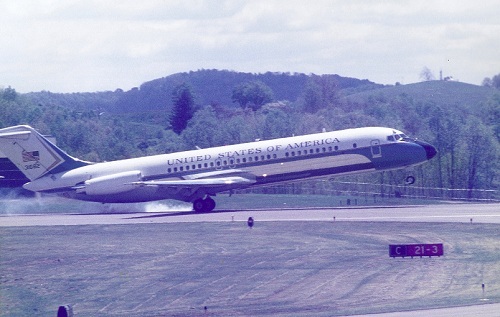 During John F. Kennedy's run for the presidency he chartered one of AeroMech's airplanes to campaign around West Virginia and surrounding areas. His brother, Robert F. Kennedy was at dad's hangar during JFK's campaign tour. During Bobby Kennedy's visit he and my father were sitting outside of the hangar on a bench talking. As you recall Bobby sported quite a mop of hair in the day. My dad told me that he actually suggested that Bobby get a haircut. Dad even offered to call his friend, Bill Diamond, one of our local barbers, to open his shop and give him a trim. If you know my father, that comes as no surprise! Well Mr. Kennedy kindly declined the offer. The first President I met was Harry S. Truman. The year was around 1964 and the airport was under a major configuration change. The air carrier serving the market at the time was Lake Central Airlines. Lake Central would later become part of the series of mergers that evolved into what is now US Airways (more on the airlines here later). Due to the construction of the new runway Lake Central could not operate its scheduled service. AeroMech was able to operate its twin engine Cessna 310 from the shorter and much narrower taxiway. The terminal building was a small structure that AeroMech shared with Lake Central. Mr. Truman was traveling from Elkins by charter aboard AeroMech's Cessna 310. He came to Clarksburg for some local events one of which we think were arranged by Senator Jennings Randolph at Salem College. I was with my father and got to meet him. I was only about 11, but I do remember it. He asked dad where he could find a phone to call his wife, Bess. Dad took him into the terminal where the airline folks let him make the call. For Mr. Truman it was just another day, and he was a very nice man by all accounts from my parents. The next visit was in the early 1980's. I was at the terminal building with Mike Delaney, a good friend of my father and our family. He had been informed that President Jimmy Carter's daughter Amy was flying to the airport. We decided to go check it out. As we were standing outside on the south end of the terminal building we saw a familiar gentleman arrive. It was Jimmy Carter. We met him and spoke very briefly. Tom Mellott was there also equipped with a camera and took our picture. I never did get a copy of that picture. I'll have to bug Tom about it and see if there is any chance he still knows where the negatives are. The next President was in office at the time and his visit was far different than those previously mentioned, and the President was Bill Clinton on May 22, 1997. He was traveling around the country having town hall meetings on education. He would go to Robert C. Byrd High School for the town hall meeting then address a crowd here at the airport. About a week before his arrival we had a visit from the Secret Service advance team. They were there to set the stage (literally) for the President's speech and also secure the scene. We were told they didn't want to interrupt our business operations, but it was anything but that. KCI was operating a very busy flight school and general aviation maintenance business as well as conducting the aircraft fueling at the airport. A couple days in to the advance team's arrival we found ourselves shutting down the flight training and maintenance work to accommodate the preparation. We had to empty the hangar of aircraft and park our flight school fleet across the airport on the day of the event. It was very inconvenient and cost us a week's revenue, but at the same time it's not every day the President of the United States visits your business location. The venue was a challenge to the Secret Service agents in that there is terrain at higher elevation to the airport surrounding where the President would be speaking. No doubt there were Secret Service snipers and special operations people scattered throughout the surrounding woods. Crowd control measures were put in place and four walk-through magnetometers where used to screen the visitors. There was seating inside the hangar and some bleachers outside. Two school buses served as the backdrop to the stage that had been constructed on site. We provided an office where the command post was established with dozens of phone lines and other super-secret support were put in place. Our employees were given background checks and clearances to be on site during the President's visit. The agent in charge's boss came in the night before the event to do a final inspection and be present during the visit. The advance team lead agent, Robert Stano, and I had struck up a pretty good relationship during his time on site. He came to me after his boss had analyzed the situation and asked if we had any masking paper to cover the windows in the school buses. Apparently, sharp shooters were able to get a shot from the surrounding hillsides through the bus windows to the podium. So of course I got the paper and we closed off the windows. The day of the event the Secret Service came to the facility to do a final security sweep. I was the only employee allowed to be in the premises during the inspection. After the inspection Stano came and got me from the front of the hangar and asked if I would go with him to the men's locker room to identify something. His boss was putting on his bullet proof vest and gear for the mission. A ceiling tile was displaced and a clothesline like chord hanging from the ceiling. They asked if I knew what it was and I responded, 'just pull on it and see what happens.' They both exclaimed, 'Don't do that!' I told them it was probably the phone lines that had been temporarily run from the mechanical room in the back of the hangar to the operations control room. The chord made it easy to pull the wires back through after it was all over. We went up front and found the phone company representative and that is what it was. A few anxious moments, but no worries. The crowd began to arrive and all was well organized and controlled. We had about twelve thousand in attendance on a beautiful day. 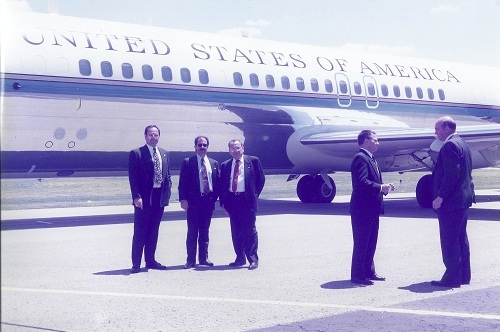 Soon after the President arrived aboard Air Force One, which was a Boeing 727 for that day's mission. They whisked the President off to his town hall meeting from the east side of the airport from the Army Guard Training Site. A few of us got to tour the aircraft and were given some little memorabilia, couple of books of matches and M&M's with the President's name and seal on the containers. Later that afternoon, President Clinton arrived and we greeted him and stood while he spoke to the eager crowd. He was then driven across the airport to the waiting aircraft and departed. As the aircraft rolled out for take-off it was flanked and followed by Secret Service sharp shooters in specially equipped vehicles. As Air Force One became airborne, the favorite words came out of the agents mouths ... Wheels Up! Mission accomplished! The next couple of days were spent restoring things back to normal. It was quite an experience, I could go on with much more details, but you get the idea. My last Presidential encounter was meeting Vice President Cheney on his visit to Clarksburg during President Bush's second run for office. I was the last of nine invited to welcome and greet him on his arrival. Then we joined his motorcade and went to the Armory where he spoke to those in attendance. Well, there is my account of meeting three Presidents and a Vice President here at the airport. I'll follow up with my recollection of more persons of interest in my next writing...thank you for reading and all the support you've given to my blog, I truly appreciate it ... until next time ... Wheels Up! 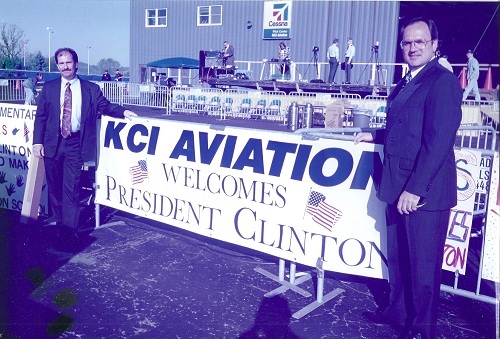 Editor's Note: These photos, submitted by Chuck Koukoulis, are from President Clinton's visit to Harrison County in the 1990s. In the top photo, showm from left, are Steve Sellas, Chuck Koukoulis and Angelo Koukoulis. Second photo shows Sellas, right, with Koukoulis in front a welcome sign, while the bottom photo shows Air Force One touching down.